When it comes to travelling, most holidaymakers want a destination that offers it all, and with a wealth of different experiences to make memories from. If you’re looking for a destination that has it all, all year round, then Mykonos certainly should be on your wish list, so stick a pin in your map and find out all you need to know about this great holiday destination. Like most of Greece, Mykonos is steeped in history and culture, and if you’re a fan of Greek mythology, then you’ll be right in the thick of it here. Legend has it that Hercules himself had something to do with its creation – throwing giants into the ocean to create the rocky island. If you’re interested in seeing a little history on your visit, then a trip to the castle of Gyzi, built in the 13th century is certainly a ‘must see’. On top of this, you’ll be able to take in the ruins of Mykonos’ previous incarnation, and even an 18th century church. A break in Mykonos isn’t complete with a little relaxation by the sea, and if its stunning beaches with golden sand and a stunning azure blue sea you’re looking for, then you’re on to a winner. Whether you take a picnic and spend all day on the sands, or visit one of the plethora of beach bars and cafes to get a little shade (recommended – it gets very hot at the height of the day), you’re certain to love sun-worshipping here. 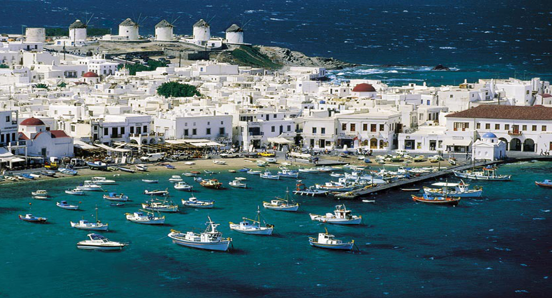 A holiday is often all about the culinary delights and Mykonos doesn’t disappoint here either. Whether you choose fresh seafood delights, the famed Mykonos sausage (it really is as delicious as they say) or fancy some of the Island’s best-known cheese – Kopanisti – with bread, you’re sure to find your taste buds tantalised. Don’t forget the Ouzo to wash it down with either! Of course, if you’re looking to visit Mykonos in the cooler months, you’ll want to know that you can still enjoy experiencing all the island has to offer. The good news is – you can. With a whole host of festivities happening all over the island, Christmas is actually a popular time to visit, with many of the cosmopolitan restaurant and bars getting into the spirit of the season by decorating their spaces and getting the outdoor heaters out of storage – although often, a warm jumper will suffice to keep the evening chill out. Whatever you’re looking for in a holiday, and whatever time you’re looking to fly, considering Mykonos and all it has to offer is certainly likely to leave you sure you’ve made the right choice of destination.